As many have known Revol Carz Makeover also provide car spray painting; panel beating and accident repair services. In this post, we feature one of heavily damaged panel where probably some may consider changing a new rear panel instead of repairing it. Not an easy task as it definitely require lots of time and meticulous effort to restore back the original looks despite most body shape line gone but glad we made it to near perfection. Let’s skip how the accident occurs and straight to the photos! Seriously Not in good shape! Rear panel and door affected together with a missing door handle cap cover! Lets’ take a look at the before & after panel beating and spray painting results! Arriving at Revol Carz Makeover for the ZeTough paint protection is the Cabrio of the Year 2006 at the Geneva Motor Show from a jury made up of 23 motoring journalists from 12 different countries. Presenting the Alfa Romeo Spider! It’s also the first all-wheel drive Alfa Spider with a 2.2 liter JTS engine producing producing 185bhp and 230Nm torque achieving its top speed 0-100km in 8.8s with a top speed of 221km/h. Alfa Romeo cars always has its’ exclusive styling with a combination in unique sportiness and elegance. Together with intensive paintwork correction; interior grooming and ZeTough glass coating paint protection, this romantic beauty once again revived back to its prestige showroom condition as one of the most gorgeous cabrio beauty! We have another Porsche arriving at Revol carz makeover for the ZeTough Glass coating paint protection and it’s the all new redesigned 2013 Porsche Boxster S.
The redesigned 2013 Boxster S simply looks stunning Gone is the bubbly jellybean design of the old car in favor of a Carrera GT inspired look. It’s longer by just over an inch, though the wheelbase has been stretched by almost two inches with the wheels pushed even further to the edges of the body. Helping make it more aggressive, it’s wider in the rear by a half-inch and gains 1.5-inches more in the front, while the car overall sits a half inch lower to the ground. After ZeTough Glass coating paint protection, this awesome beauty will surely have more head turner on the road with its distinctive sporty looks and body curves. Hari Raya Puasa marks the end of the fasting month of Ramadan. It is a time of forgiveness within the Muslim community and a time for strengthening of bonds amongst relatives and friends. New clothes, decorated houses and exchange of invitations between friends and relatives commemorate Hari Raya Puasa. The New Mercedes Benz A class definitely surprise me with its fresh, sporty design that blends emotive appeal with individualistic character and strikes a completely new note in the compact vehicle segment. We had an enjoyable chat with the A class owner on his new car design and we do agree with him that with its completely redefined design… more Mercedes Benz A class will be expected to be seen on the roads from more younger group owner. 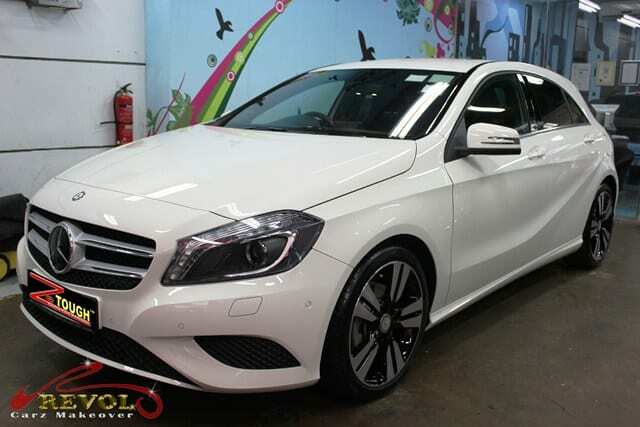 The Mercedes Benz A has a 1569cc engine that produces 156 bhp with a top speed of 224km/h. She goes from 0-100lm/h in 8.3s and has a 7G-DCT dual clutch transmission. After ZeTough glass coating paint protection, this attractive white beauty with its noticeably glossier and prominent striking structural lines. is ready for more attention!! !